The numbers are in from the first half of 2017, and American crude oil exports reached a record high of 900,000 barrels per day (b/d)—an increase of more than 300,000 b/d from the first half of 2016, according to the U.S. Energy Information Administration (EIA). Not only has the volume increased, the number of destinations for those exports also has grown to 26 countries from 17 at the beginning of last year. Ever since the crude oil export ban was lifted at the end of 2015, global markets have looked to the United States to help meet their energy supplies. While Canada remains our largest customer, Asian countries in particular have quickly started making significant purchases. October marks the first month that India joins the ranks of other Asian importers of U.S. supply, a list that includes China, Japan, and South Korea. It’s a promising trend for U.S. exports in light of recent reports from OPEC showing growing demand from the East Asia. But let’s not forget exports of American refined petroleum products, which also have increased over the past year. 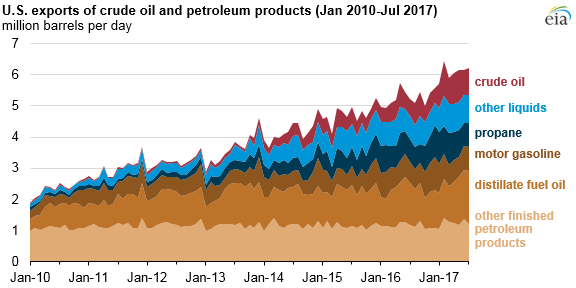 Although the United States is still a net importer of crude oil, we’ve been a net exporter of refined petroleum products since 2011. Mexico has been the biggest buyer of U.S. gasoline exports—more than half—thanks in part to its own market reforms allowing for foreign petroleum product imports. The country also experienced a number of unexpected refinery outages in the first half of 2017, and American energy companies have been fortunate enough to help Mexico, and others, fill crucial supply gaps in times of need. The impact of hurricane Harvey, which shut in about one fifth of U.S. refinery capacity, on refined products exports in the second half of 2017 remains to be seen, but its effect on these longer-term trends will be temporary. A healthy energy export pipeline means a stronger economy, more jobs and investment, a more-favorable balance of trade, and greater energy security—and there no signs of it slowing down. Whether it’s U.S. natural gas, crude oil, or refined products, these energy exports are solidifying America’s role as a global player on the world energy stage.